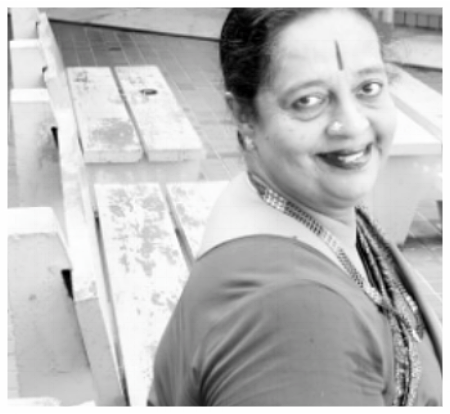 The dance community in Singapore had only one Mami and that was Neila Mami, Mrs. Neila Sathyalingam. Yesterday, all of us here felt shock and sadness on hearing of the passing of this grand doyenne of dance in Singapore. Indeed her fame and reputation extended beyond the frontiers of Singapore. It was in the 70s, when I was a young student of Bharatanatyam in Singapore, that I began to hear of Neila Mami. Some of our family friends sent their daughters to learn dance from her. I gradually became aware of the fact that she had arrived in Singapore with her husband who was a talented and respected vocalist. She taught the Kalakshetra style of Bharatanatyam, and she was also actively involved with the People's Association here, working closely with Malay and Chinese choreographers. I didn't have a chance to get to know her beyond that at the time - I was barely 12 or 13 at the time that Apsaras Arts was started. Also within the Indian silo in Singapore, there were institutional silos. We didn't have social media then to transcend those boundaries very easily. But what is vivid in my mind is how struck I was when she called me "darling" when I first met her. That really touched me as I'm sure it must have many others. At home, Mami was awarded the prestigious Cultural Medallion in 1989, which is the highest honour awarded in the field of arts. In Chennai she received the Viswa Kala Bharathi from Bharat Kalachar, a Chennai-based organisation that is focussed on nurturing the performing arts. She was the founder director of Apsaras Arts, a leading Indian performing arts company here. A few years ago, Mami handed over the reins of her company to Aravinth Kumarasamy who is now moving Apsaras Arts forward. At the time of her passing, the troupe was on a performance tour in Sri Lanka. I may not have learnt Bharatanatyam from Mami, but this I learnt from her - that when the time is right, it is important to choose what is most meaningful and closest to one's heart, and to be able to let go of everything else. She showed me that in an instant, she was willing to abandon material rewards for spiritual satisfaction. On April 29th last year (International Dance Day), she received her first embrace from my spiritual Guru Sri Mata Amritanandamayi (AMMA). When I called to invite her to be blessed by AMMA and recognised for her contribution to the field of Dance, she accepted joyfully. At the 11th hour and due to unforeseen circumstances, the event was shifted to the next day. Mami was scheduled to travel to KL that day to receive an arts award but told me she would call me back as her heart was longing to be with AMMA. The next day she called and confirmed "yes". She had cancelled her KL trip. After the special ceremony, I went to where she was sitting. She was wiping her tears. Tears of joy they were, rolling down her cheeks. She told me she had had a beautiful Darshan, was happy and very very satisfied. Rest in peace, Neila Mami ... thank you for your immense contribution to the field of Dance on our sunny island. Your presence has enriched us and your memory will continue to inspire generations of dancers. As for me, I will always remember the intense bliss, gratitude and satisfaction that you radiated that evening. Aum Namah Shivaya.